Telling it Straight is a regular public speaking tips newsletter delivered straight to your email inbox. You can always subscribe today and receive a free eBook, "The Top 5 Presenting Mistakes". 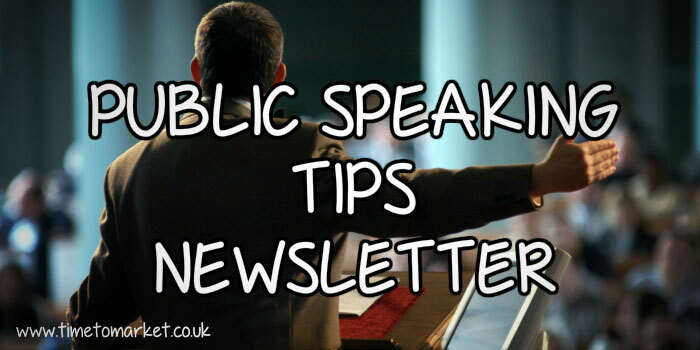 You will find this public speaking skills newsletter is packed with public speaking skills advice, tips and techniques for better speeches. So the newsletter is perfect material to help you with all your conference speeches, presentations and seminars. No matter what level of public speaking expertise you already have, there's bound to be some room for improvement with all of us. Whether that's style or substance most of us have those moments when we'd wished we'd said or done something different. Certainly this David Cameron speech proves the point: check your facts first. essential quotes for your speeches. reference notes for your speeches. When you complete your email address, this regular skills tips newsletter will be in your mailbox each month.You can call 01344 859823 or email training@timetomarket.co.uk for more details. We manage all the Telling it Straight newsletter lists with double opt-in security. This makes them very tough for third parties to join you to a list. Also, you can unsubscribe from the list at any time using the opt-out link on each newsletter. Our in-house team, including Andrew Ivey, share their public speaking skills advice and techniques with an occasional series of published articles full of public speaking skills tips. Join today so you can share the tips. "Rhetoric paints with a broad brush."